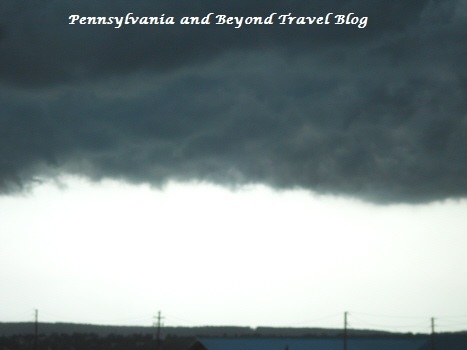 Our photo of the week for this week is one I took while standing on my back porch this past Thursday (July 26th, 2012) as some nasty Thunderstorms rolled into the South Central Pennsylvania area. This dark cloud wall was amazing to see! You could see black clouds swirling all around in different directions and at one point we thought perhaps a tornado was forming. I am not sure if I have ever seen a storm cloud wall like this one! As the storm continued to roll in...the winds kicked up, the downpouring rains fell and we had some pea-size hail for about 45 minutes or so. The lightning was incredible from this storm and it really was something to see. After it was over, we had some minor yard damage from flying debris and some minor tree damage. My hubby loves storms so he was watching 1/2 of it from our back porch and the other half safely indoors.